Another model that is expository rather than poetic is that of Shu-Ha-Ri. Here is a brief article that describes this model in terms of its original context, the martial arts. I love that the word “agile” is so evocative of dance and martial arts. Agile is the dance of teams, the dance of organizations taken to a new level. 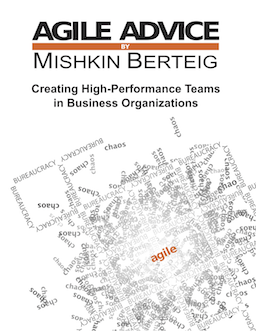 Instead of chaos or instead of strict bureaucracy, agile provides the Shu practices to balance chaos and bureaucracy, the Ha principles to allow for variation, and the space for Ri for a team to become agile and define agile by its very behavior. As Tobias implied, teams will learn to cut the Ox of the bureaucratic organization. But teams will also learn to turn the chaos of life into a beautiful dance.